This is an almost entirely palearctic genus of well over 100 species. A Dysaphis found mid-winter on a parsley plant in our kitchen window. Many of these host alternate from trees and shrubs in the Rosaceae, Pyroideae to Apiaceae and several other herbaceous plants. The species-level taxonomy is very complicated and challenging, and I have had almost no exposure to the genus in person. 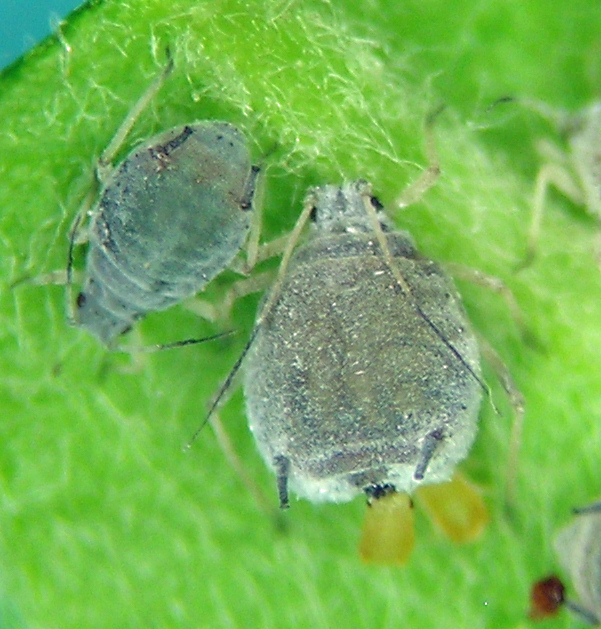 One pest species, the rosy apple aphid, is familiar to many economic entomologists in North America. Dysaphis can be rather commonly trapped in the irrigated agriculture regions of northwestern North America, presumably species feeding on cultivated Apiaceae, although I have made little attempt at species-level identification due to tricky taxonomy and limited knowledge of species that have been established in North America. 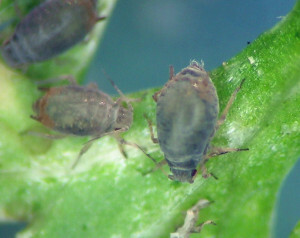 This is the rosy apple aphid, a pest species introduced from Europe. It feeds on apples in the spring and fall, migrating to Plantago in the summer. Despite it being a pest species of some fame, I have rarely collected it on apples, and only once on Plantago. Dysaphis plantaginea on our neighbor’s apple tree near Boise, Idaho.